This was from some photos I took in Calvi, Corsica. I have posted a set of café scenes last year on this blog but a number of them were disappointingly flat. I recently saw an article in the UK magazine Artists and Illustrators by Hashim Akib. I liked the vibrancy in his paintings – I presume it is a him- using chiselled brushstrokes and juxtaposing tones and hues. 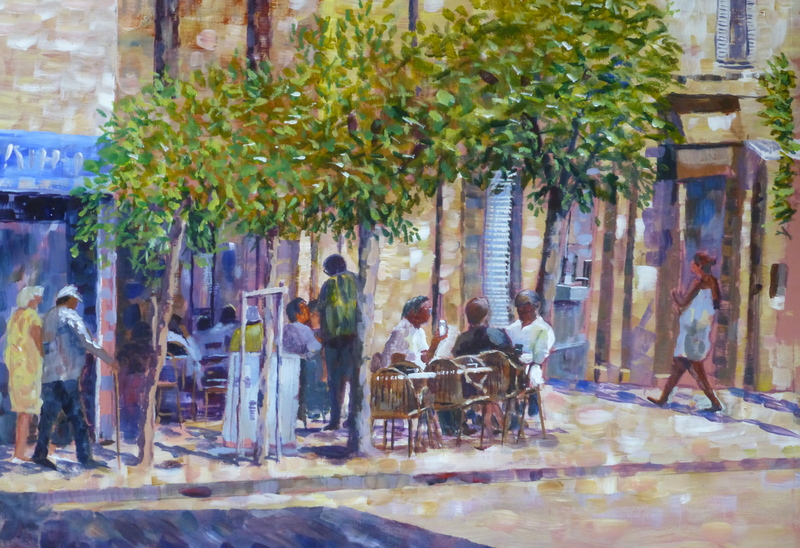 So I thought I’d have a go with this street scene in Calvi. I was pleased with the result. I can feel the heat amid the slabs of colour and it has forced me to be less descriptive. I am pleased enough to try again and do a version of the boules players I did a few weeks back in situ, whilst on holiday. I’ll post that when I’m done. Other paintings are on my website grahammcquadefineart.com. 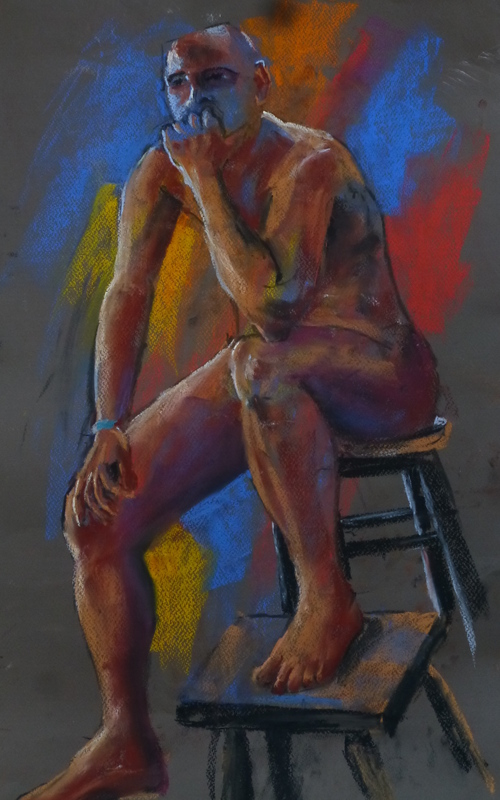 As in the last pastel life drawing this fellow was also new to posing, but the management got him seated after the last guy finished up staggering across the studio. I started with some bright colours and then wondered what I’d done, but once they got toned down with some flesh colours they shone through well in fact I think I could have let a few more through, particularly the red. Well, as you can see I’ve been playing around with the earlier post. 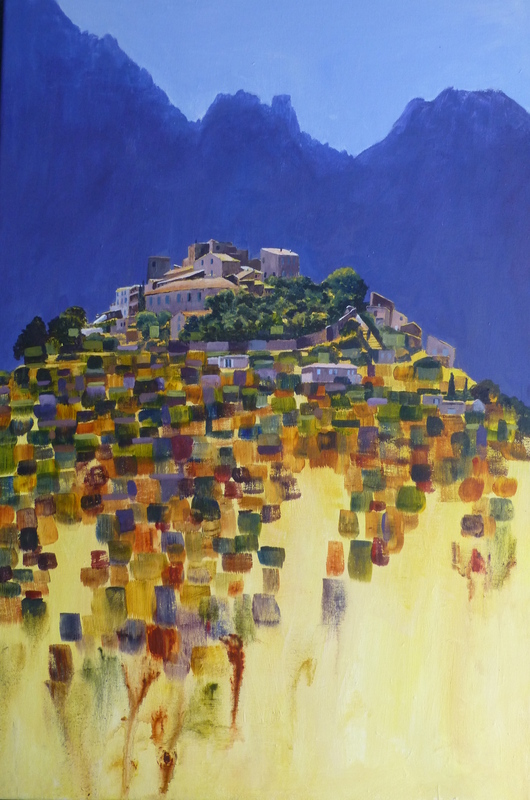 This time I drove the yellow underpainting into the citadel area and then drew the buildings and trees in on this underpainting before putting in the background mountains which I left very simple and painting upside down got some nice light effects on the mountain tops. 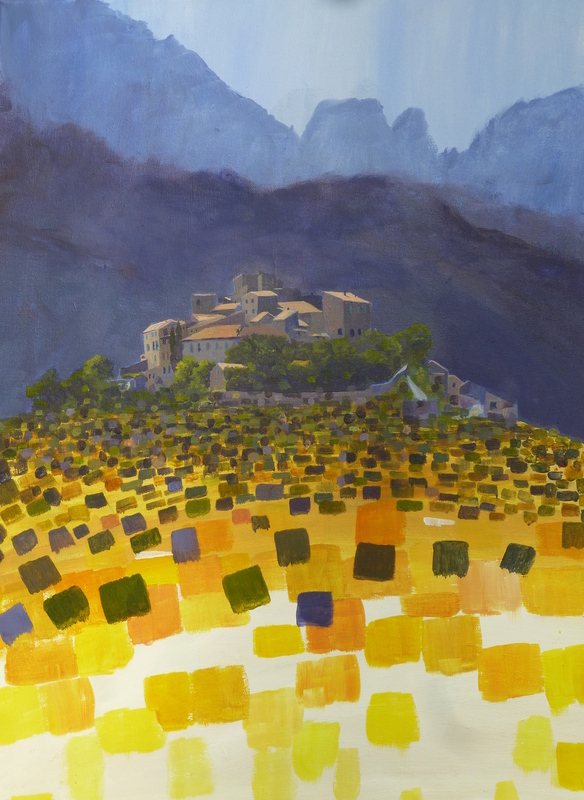 I let some of the yellow underpainting show in the citadel which further unites the foreground and middleground. I also played around washing some of the bottom squares away. I now wish I had done more. I rather like the effect and might experiment with this later. I also added some of the buildings which were lower down the slopes in an effort to unify. Much happier with this which I hope conveys the heat and brightness of the day. 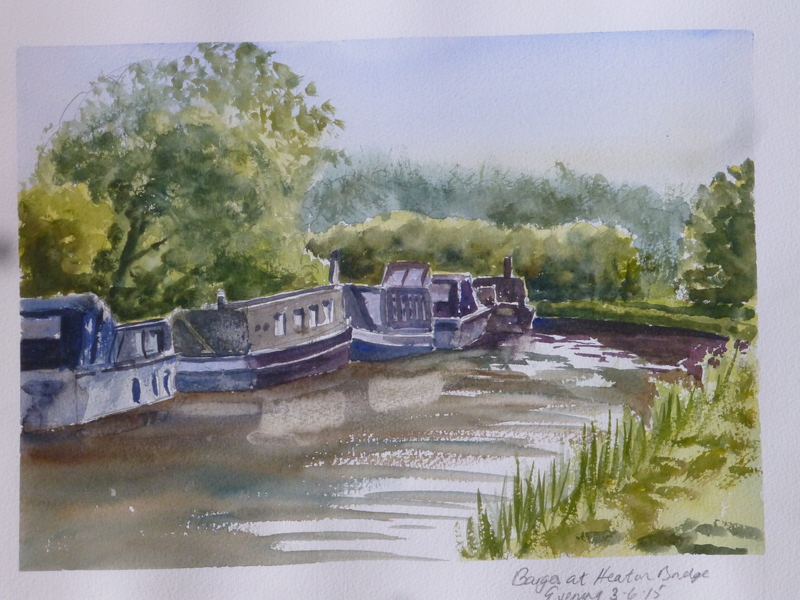 Over the last couple of weeks I’ve managed to get out and do a bit of plein air painting. 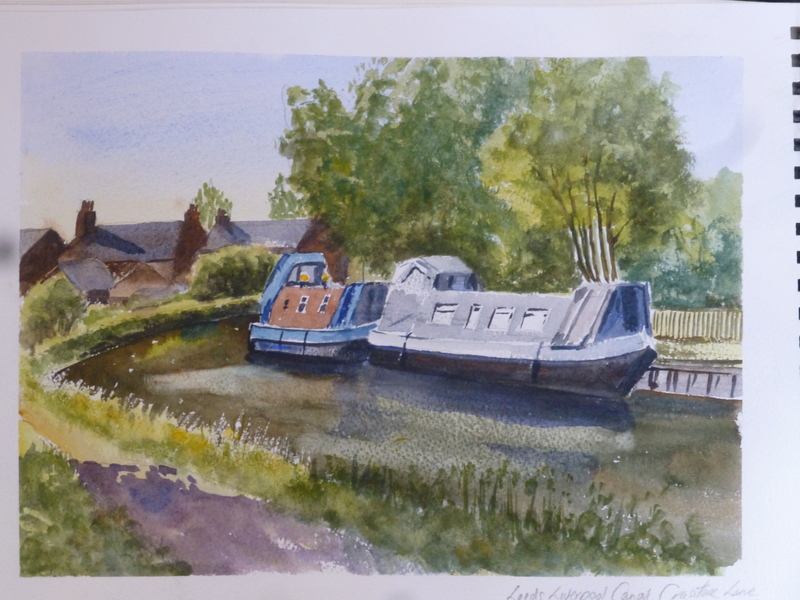 These first forays were along the canal. This wasn’t one I did in situ, but is an amalgam of photos I took. I have done this view before, but in the earlier painting there are a row of cottages which are now hidden by the trees on the left. In my earlier painting they were a major part of the image. 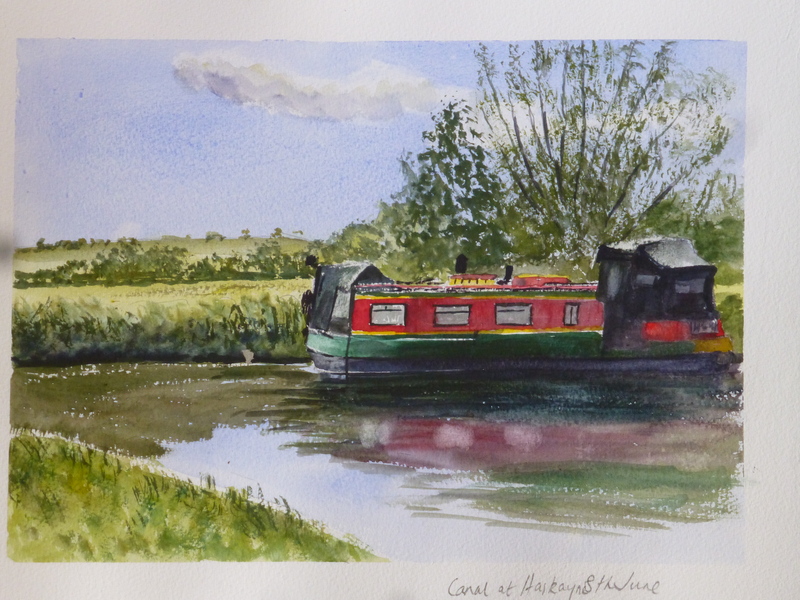 Now it falls on the narrowboats which are moored along the banks. I took one of the sketches I did whilst on holiday in Corsica and tried working it up into an acrylic painting. I liked the shapes of the buildings in this hill-top hamlet and wanted to reflect this in the foreground.I don’t think this has worked and need to take stock and seek another approach. I do like the village against the brooding colours of the distant mountains with the light reflecting off the rooftops, but the foreground needs further thought. 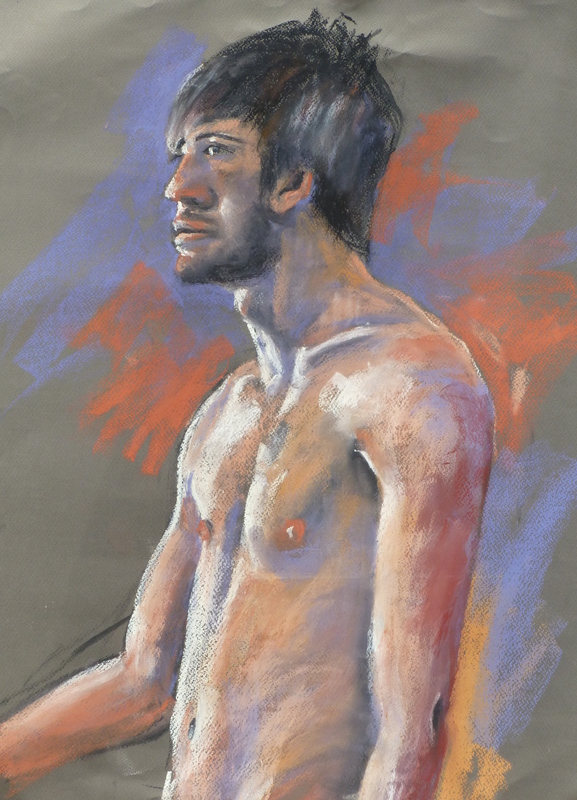 I will try again in the next week or so..
We had a new model at the life drawing group. He hadn’t modelled before and took up a standing pose. He insisted of standing for the first hour without a break. However, He hadn’t reckoned on the stress that posing takes and ten minutes before the hour was up he was staggering around. He nearly ended in my lap. But give him his due, after the break he resumed the pose, and with regular breaks completed the session. I saw some pictures of seagulls and liked the strange shapes the wheeling birds created. 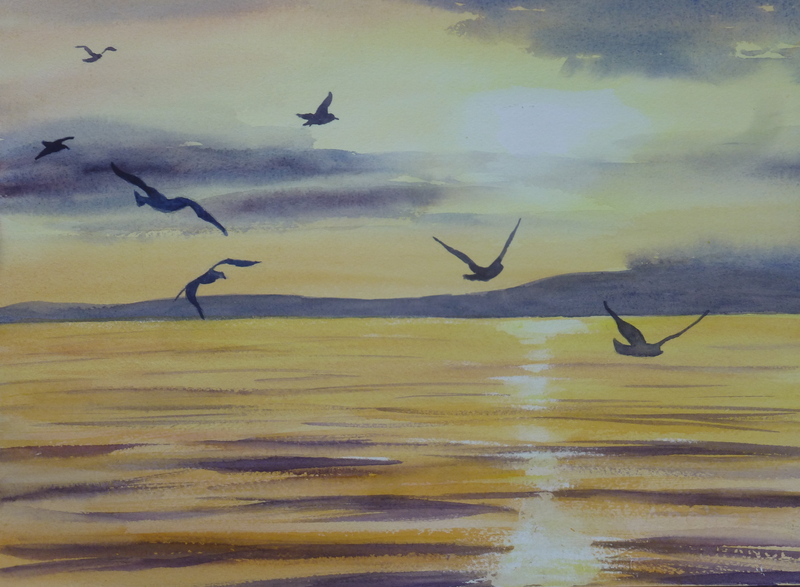 I decided to put them in a sea sunset and felt it could be a boat returning to harbour, throwing scraps of fish overboard as it chugged through the dying day.